Go the app screen and tap the stopwatch icon. 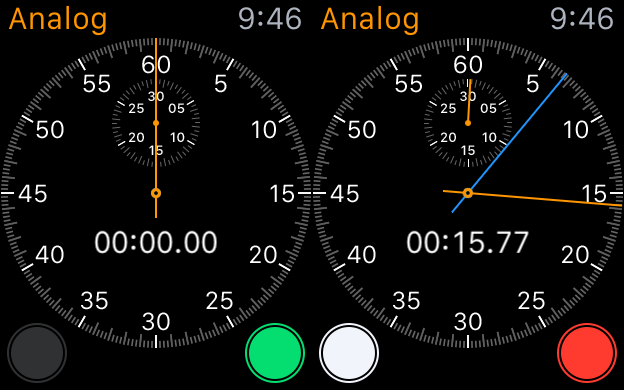 When the Stopwatch loads, you’ll have four choices: Analog, Digital, Graph, and Hybrid. When you choose one, you can always get back to the selection screen by pressing down on the Watch’s face until they appear. 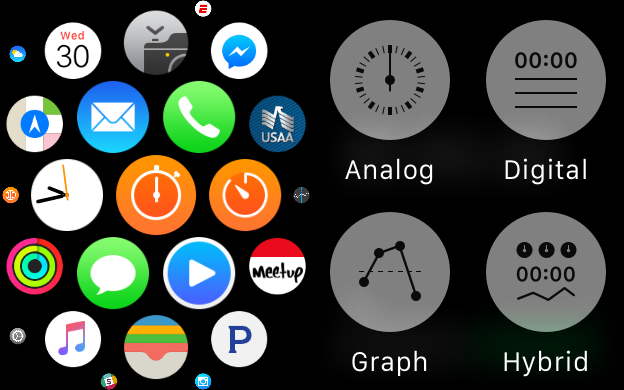 If you ever want to get back to the mode selection screen (picture right), simply press down on the Watch face until it pops up. The Analog stopwatch looks like your traditional stopwatch, as was popular in the 20th century before digital stopwatches became the norm. At the bottom of the Analog watch are two buttons. The green button starts the watch. Once you start timing, you can press the white button for lap times. Press the red button to stop. Once stopped, press the white button again to reset the watch. The Analog mode does everything the other modes do. The only thing it doesn’t do is tick. The Digital stopwatch will be much more familiar to most people. 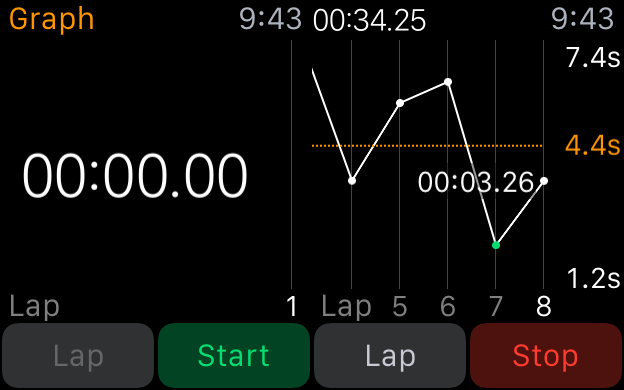 Again, like with the Analog mode, press the “Start” button to begin timing, press “Lap” to record you lap times, and “Stop” will obviously halt the entire process. Once stopped, the Lap button will turn into a Reset button unless you choose to start the watch again. The Digital mode is probably more of what you’re used to and resembles what you find on your iPhone. The Graph mode is a bit different, but very useful. 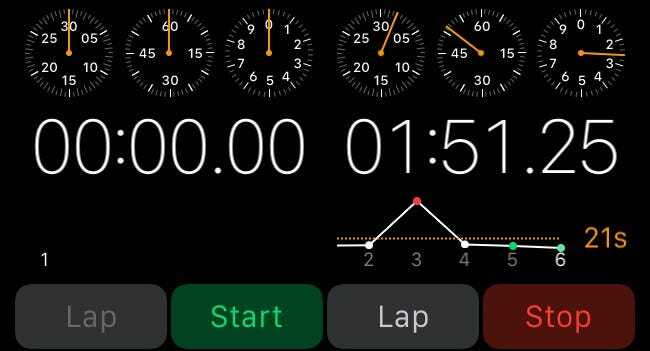 This stopwatch is intended to give you a visual idea of lap times by plotting them on a horizontal line graph. Each time you press the “Lap” button, it will place a dot at that lap’s time. The orange line that runs across it represents the average lap time, which is good information to know. The Graph mode is a great way to visually see lap times and lap time average. 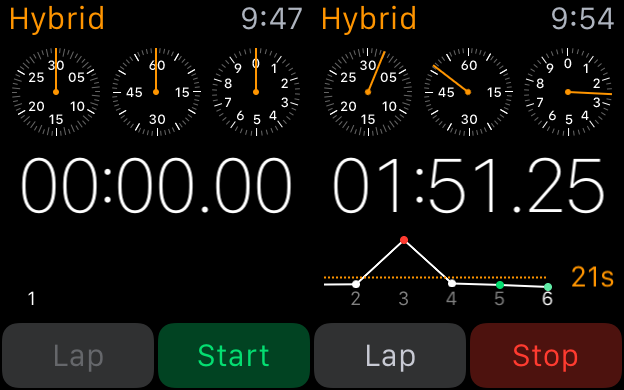 Finally, there’s the best of three worlds: The Hybrid stopwatch mode combines the Analog, Digital, and Graph modes into one single mode. At the top of the Hybrid display, you see the analog functions, in the middle is the digital readout, and at the bottom you’ll see the graphed lap times, so you don’t have to make a choice, you can simply use Hybrid and have everything in one mode. Something for everyone, the Hybrid mode incorporates Analog, Digital, and Graph stopwatches. 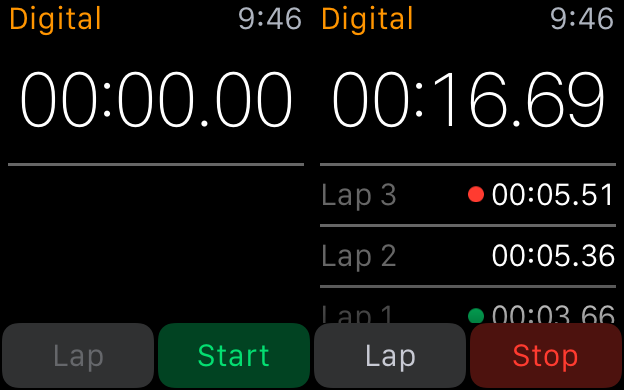 Using your Apple Watch as a stopwatch may seem like a no-brainer, but it’s not immediately obvious that it even has a stopwatch function unless you sort through the many included apps. Once you do use it for this purpose, though, you’ll see that it is a handy and convenient way to time people and events. The inclusion of four stopwatch modes means that there’s something for everyone’s particular tastes and needs.